This home on Peabody Drive experienced the worst storm damage in town, after a pine tore through the roof and attic, landing on the 2nd floor. Two young children narrowly escaped being hit by the tree and crashing debris. Hurricane Sandy blew into Stow on Monday with high winds and rain whipping through the town for most of the day and into the overnight hours. 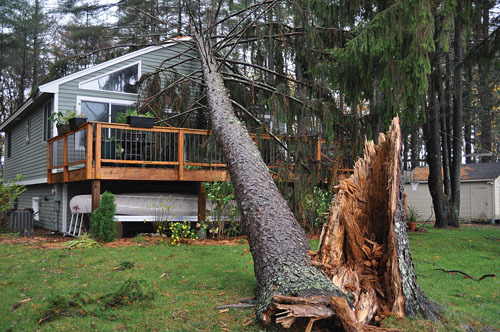 While Stow was spared from the type of destruction seen in areas closer to the storm’s center, several homes did sustain extensive damage after large trees fell across them and in a few cases, into them. School was cancelled for 2 days, with power outages and many roads blocked by downed trees, branches and power lines. A house on Peabody Drive took the worst hit when a giant pine crashed through the house, sending roof joists, HVAC ductwork, the attic and its contents down onto the second floor. The family’s two young daughters were in an upstairs hallway and luckily escaped without injury as everything fell down around them. Hudson Light & Power cut the electricity to most of the town on Monday evening, in order to do emergency repair work on the main feed line on Hudson Road. “They could have had a fireball travel down the entire line if they didn’t,” said Highway Asst. Superintendent Scott Morse. The lines on Hudson Road were so tangled from fallen trees and branches that HL&P crews felt they could not safely disengage the main feed lines without potentially creating an even more dangerous situation. A temporary transit line was put in place and electricity restored after 40 minutes, though the road remained closed for several hours while the larger repair work took place. Tuesday morning’s light revealed even more trees had fallen, taking out power lines and blocking roadways. Morse placed a call to First Student Transportation at 4:30am, informing them that, in his opinion, the roads were unsafe for school bus travel. “There were wires down that may or may not have been live, and we were starting to close roads,” he said. “I left my cell number for the Superintendent to call me, but I did not hear back from anyone,” he said. Shortly thereafter, the Nashoba District issued a 2-hour delay to school opening. At Tuesday’s 8AM Emergency Planning Committee meeting, Morse said, “There are still a lot of dangerous areas, with live wires near the ground. I am very concerned about kids going out to wait for buses or buses trying to pass through these areas,” he said. 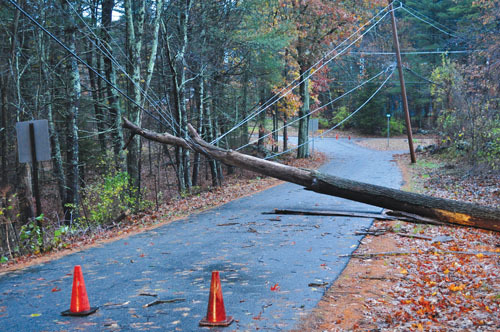 Nashoba Facilities Manager Bill Cleary reported that School Superintendent Michael Wood had called into the police dispatcher around 5am and concluded that with only a few roads closed and power mostly restored, there was not a real danger to students. The committee, including the fire and police chiefs and Selectman Tom Ryan, determined that the school opening was a true danger and should be reconsidered by the District. A call to Michael Wood brought in Assistant Superintendent George King. “There appears to have been some miscommunication,” said King, who stressed that parents would not be happy with this last minute change, especially working parents who do not have child care arrangements. At that time the high school buses were due to pick up students within 15 minutes, followed soon thereafter, by the middle school buses. It was determined that in future storm situations, the police dispatcher will be given updates, as available, from all relevant departments, prior to the anticipated 5:30am school decision time. Check in on the “Stow Police Department” page on Facebook and on our website at www.stowindependent.com for further updates. 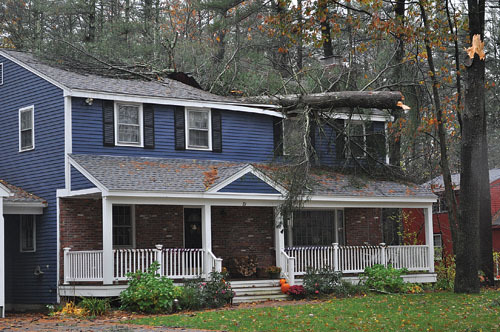 This Lake Boon home on Barton Rd received a crashing blow from Sandy. Downed power lines and fallen trees kept Hudson Light & Power and Stow Highway crews busy all night long and into Tuesday afternoon. This was the scene on Hiley Brook Road. 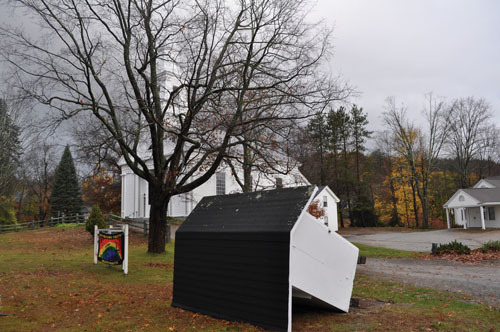 Apple Turnover… The First Parish Church Apple Pie Stand was blown over in the hurricane.